Polaris Industries has been running flat out since the introduction of the first RZR 800 back in 2007 and the new RZR XP 900 H.O. 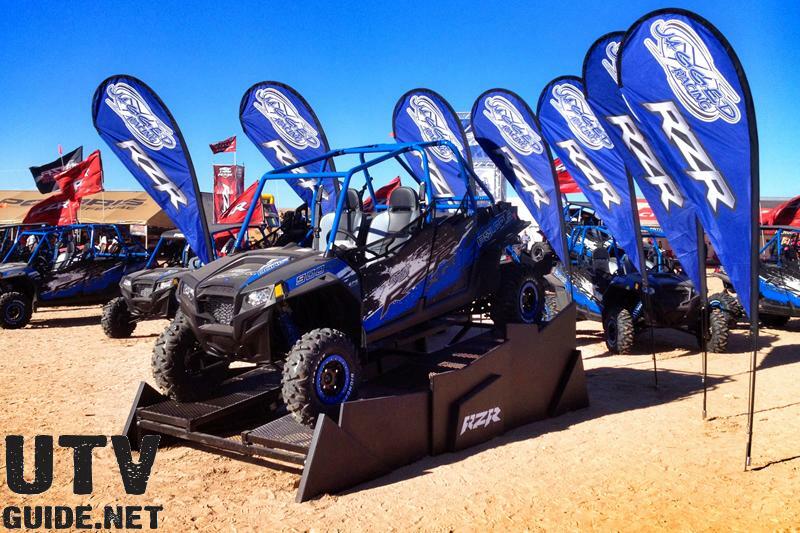 Jagged X Edition adds to their impressive line-up of high-performance sport UTVs. This new two-seater is a limited edition RZR XP that was inspired by Jagged X and is based on the popular four-seat RZR XP 4 chassis. The Jagged X Edition RZR XP might not be for everyone, but Polaris has a keen eye on the marketplace and has created a premium vehicle that combines awesome styling, increased performance and more comfort. 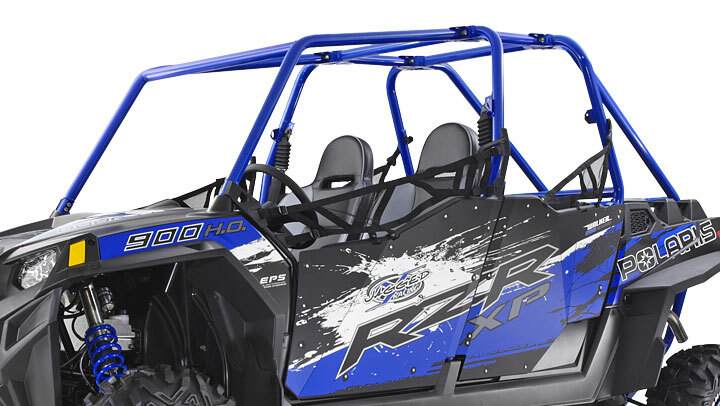 Many enthusiasts were hoping for a new RZR XP platform that was somewhere in the middle of a RZR XP and a RZR XP 4. 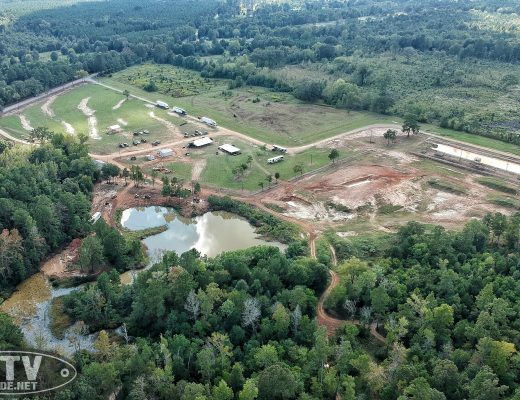 They have been “trained” by the last two big releases at New Year’s by Polaris and this anticipation created a lot of hype on the internet that translated into expectations for another completely new vehicle. Those are some awfully big shoes to fill, especially if you look back at 2012 and see that this is the third press introduction I have been to for Polaris in the span of twelve months! I have no doubt that Polaris will continue to impress us with new sport UTVs, but we may have to wait another six to twelve months to find out. 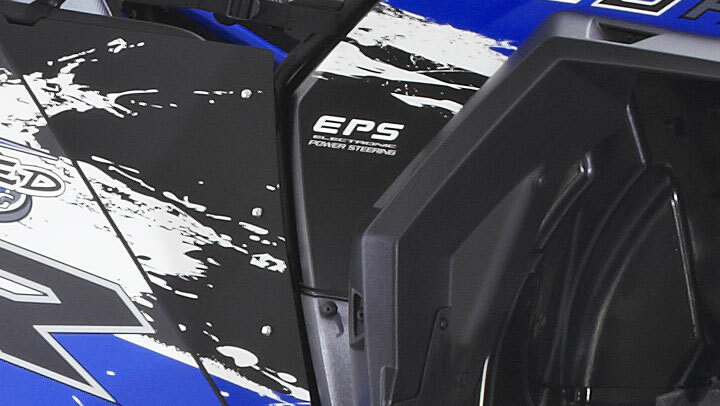 Meanwhile, this new limited edition RZR fills in a small void in the Polaris line-up. The Jagged X Edition RZR XP features the first high output engine on a RZR, a 94 horsepower ProStar 900 Twin EFI engine coupled with a stainless steel SLP® exhaust; a long wheelbase for a smoother ride; comfort features such as premium Walker Evans 2.5 inch Body Rear Shocks, Electronic Power Steering and PRP seats; and premium features such as a custom cab frame, factory-installed doors, dual removable cargo boxes, Bighorn tires on painted Walker Evans beadlock rims and a Jagged X-inspired graphics package. I traveled to theImperial Sand Dunes Recreation Area in Southern California where Polaris hosted its first ever “Camp RZR“. 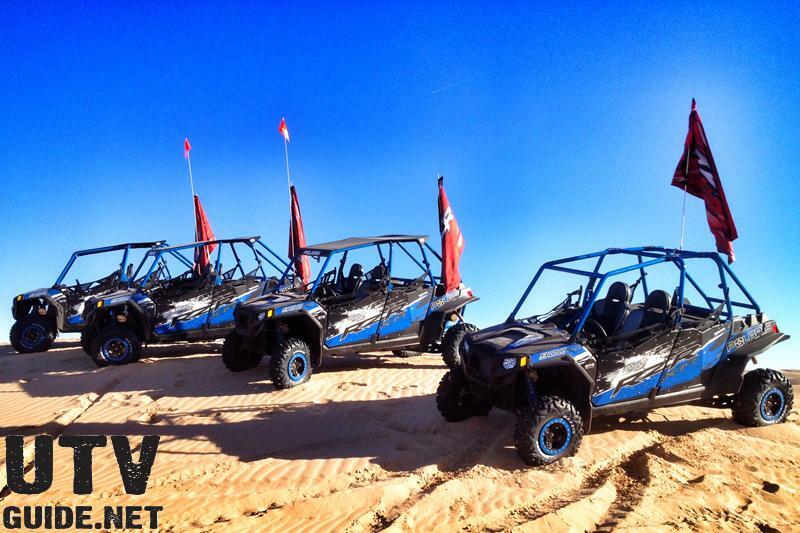 The event was held on nearly 10 acres of Glamis Beach Store property and featured a family-friendly environment geared towards celebrating the “RZR”. On hand with displays were FOX, ProLine Wraps, UTVUnderground, Dirt Theater, Go Pro, Traxxas, Holz Racing Products, Jagged X, American Sand Association, Ride Now, Walker Evans Racing, High Lifter Products and Polaris Defense. 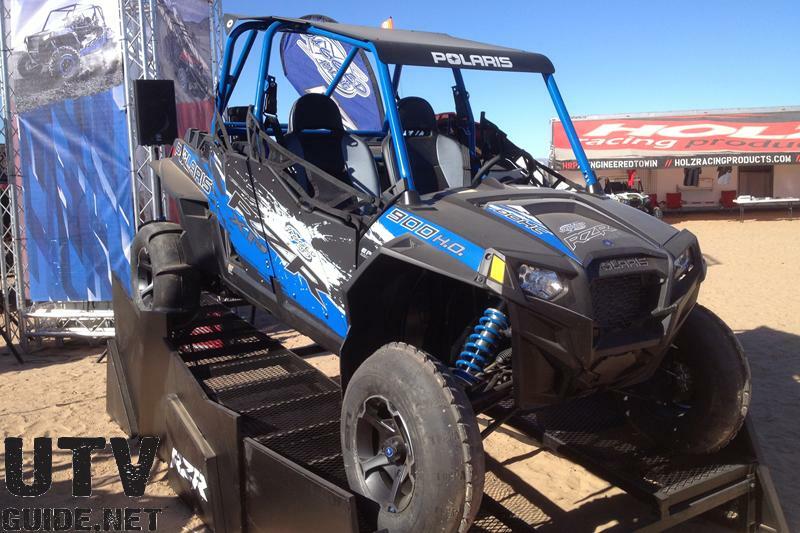 Polaris invited members of the media to pick up their new RZR XP 900 H.O. Jagged X Edition demo units at the event and allowed us to hit the dunes to try out the new vehicle. 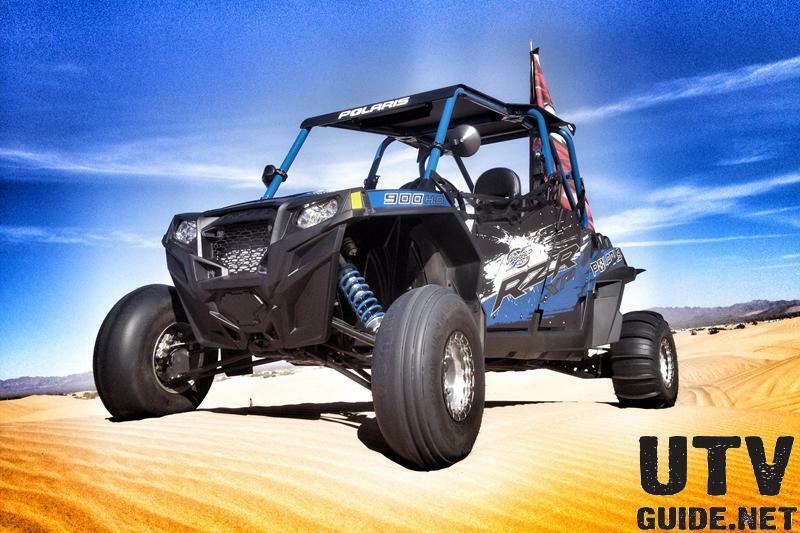 Glamis is a great destination to illustrate the features of the new Jagged X RZR XP. It is part of the Imperial Sand Dunes which are the largest sand dunes open to off-highway vehicle use in the United States. The dunes begin 10 miles southeast of Niland and stretch all the way into Mexico, over 40 miles away. The Dunes vary in width from about a quarter mile at the top end of the Mammoth Wash area, to over 5 miles in width below Highway 78. After arriving in Glamis on Wednesday, I played for a few days in my2013 Polaris RZR XP Orange Madness LE and awaited Friday afternoon. I showed up at Camp RZR with a dozen or so other editors and waited for Polaris to hand over the keys to the new ride. They gave us a quick overview of the features specific to the Jagged X Edition and then set us free to have fun. Sometimes this job isn’t half bad! I hooked up with Cody from Dirt Wheels, Troy and Don from UTV Off-Road Magazine and Wally from Dirt Sports and headed into the dunes. We took off from Glamis Flats and headed towards Oldsmobile Hill through the baby dunes. After a few pictures, we tore off towards Olds and it was game on all the way to Osborne Overlook. I led the ride and it was big fun to watch Cody, Wally and Troy in the rear-view mirror while they diced it up trying to gain position. The next morning, I added a few accessories to the new Jagged X RZR XP to make it more dune worthy. First thing was to mount up some sand tires. I got this set of STU Blasters from Fullerton Sand Sports and have them mounted up on 12″ OMF Billet Center Beadlock wheels. These tires are my absolute favorite in the sand and the changeable center on the OMF wheels allow me to swap between several different UTVs. Next I added SSV Works side-view mirrors, an Axia Alloys panoramic mirror and Axia Alloys fire extinguisher and mount. Aaron from PRP Seats stopped by our camp to check out how his seats looked in the new car and then I twisted his arm into going on a ride with me. Later in the day, I hooked up with 2012 WORCS champ Ryan Piplic for a ride. He wanted to see what the extra wheelbase and power was like in the dunes. 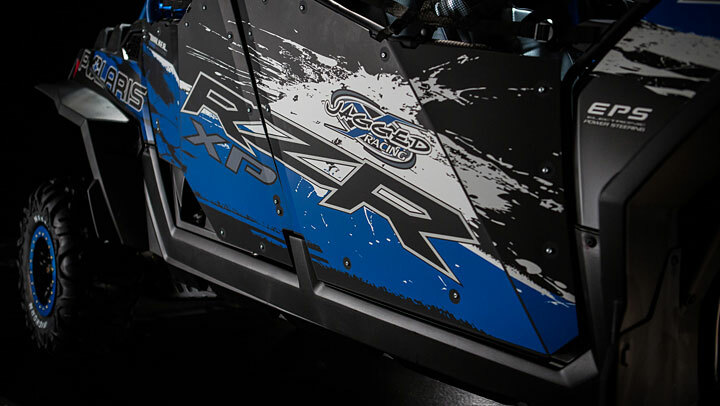 The new Jagged X RZR XP is a great addition to the Polaris RZR arsenal. The car is perfectly suited for the type of riding I like in the dunes and desert. Ample storage, solid power, great looks and added comfort from the power steering, PRP Seats and additional legroom. A few minor issues that could make the new Jagged X RZR XP even better. The first would be that I now need a telescoping steering wheel. I am 6′ 1″ tall and the additional legroom is definitely appreciated, but my arms aren’t long enough to comfortably grip the wheel when the seat is adjusted for legroom. 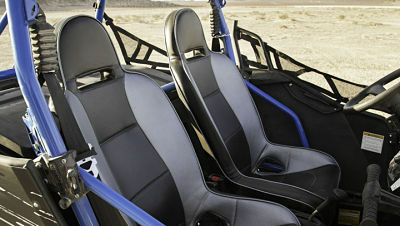 The second item is to add seat adjustment to the passenger seat. Deep-bolstered, five-point harness-ready PRP seats, the most-comfortable seats on the market, and a sliding seat for the driver with more than 3 inches of adjustability make this the most comfortable. The seats have a nice mesh area near the rear so water flows through for easy cleanup and drying. For added storage, weather-sealed, double 2.5 cubic feet storage boxes in the rear cab area that have lockable lids and are easily removed. 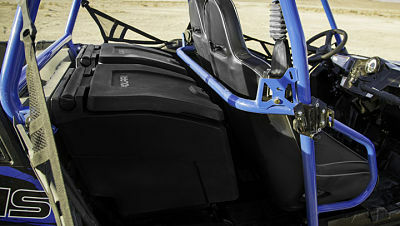 These boxes use the stock seat mount so they can be used in other Polaris RZR vehicles as well. Premium factory installed doors make this the ultimate in premium factory stock vehicles. Absolutely love the flat black/blue color scheme too. Race-inspried lightweight aluminum construction with rubber mounted vibration dampeners. Made with a steel frame, hinges and latched for rugged off-road durability. Factory installed stainless steel SLP exhaust silencer with dual outlets for increased exhaust flow and an aggressive race-inspired sound. The sound is just slightly louder than the normal single outlet exhaust found on the RZR XP. 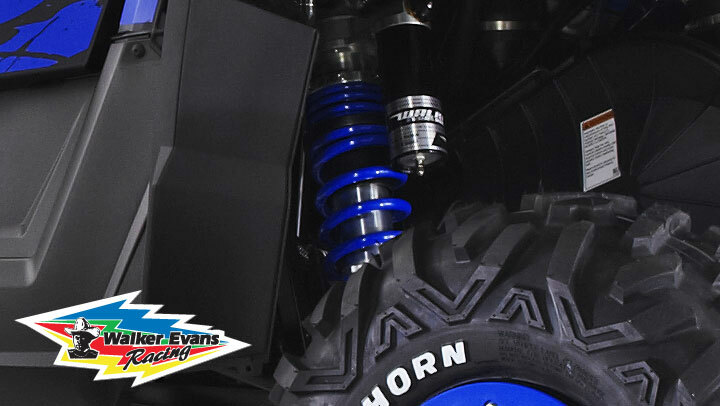 Standard Premium Walker Evans 2.5″ rear body shocks provide extra volume needed to dissipate heat and provide an incredible 14″ of suspension travel to soak up the bumps and whoops. I did have to crank up the compression quite a bit to keep from bottoming out with two people in the car. My feeling is that the shocks have been tuned to suit the widest sweet spot and I would prefer to have them setup for dunes and desert. Not a huge deal to have them revalved. Custom-inspired cab frame with rear frame extension and Voodoo Blue paint. 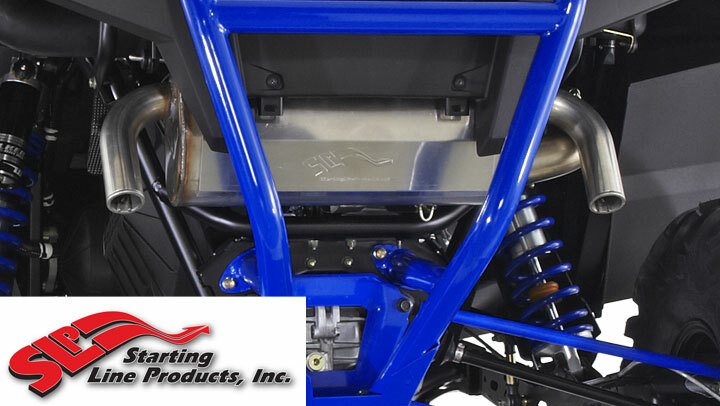 This cage sits lower in the rear than the RZR XP 4and also extends to the rear differential area. This really makes the Jagged X RZR XP look more aggressive. Bighorn tires on gloss black, powder coated aluminum Walker Evans wheels with color-matched beadlock rings. Standard and True Bead lock mount capability allow you to tackle the roughest terrain. 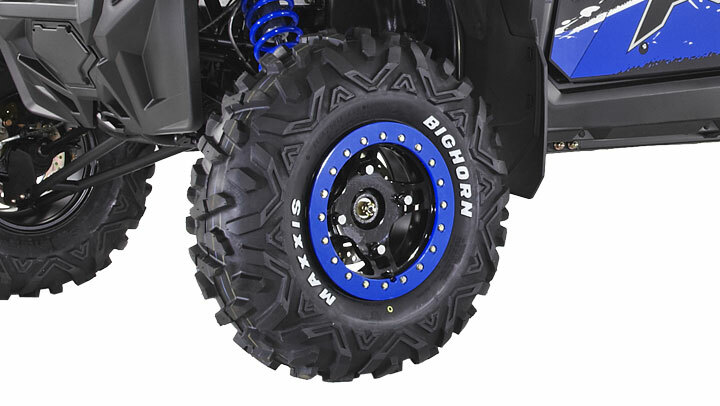 The Bighorn tires are a great all-around choice and the beadlocks are a nice touch. Only complaint is the tires come mounted on the standard bead instead of the beadlock. Not a big deal, but it does require some work. Electronic Power Steering (EPS) features variable assist to reduce rider fatigue and steering effort comes standard to tackle the toughest terrain. I absolutely love EPS in any UTV and this setup works great.